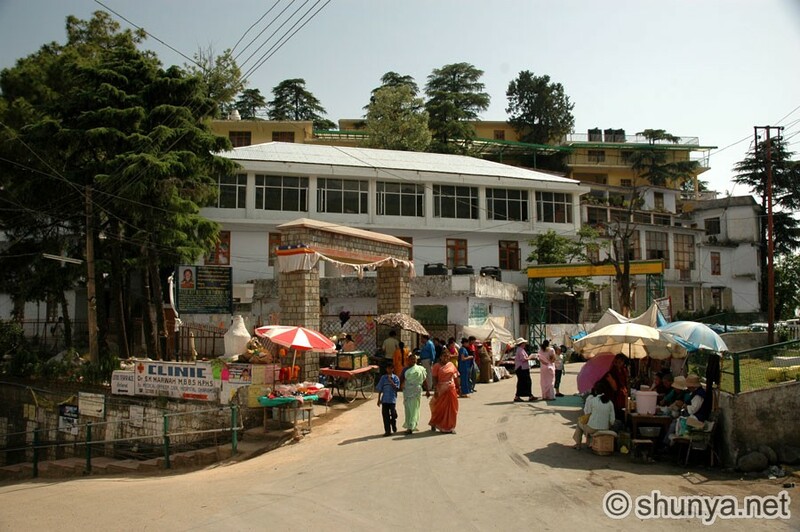 These were the first words I heard upon arrival to McLeod Ganj, India, exile home of His Holiness the 14th Dalai Lama. The strong smell of burning incense and Tibetan momos filled my nose as I deconstructed the statement I had just heard. Taxis and rickshaws noisily whirred by as I became enlightened to the magnitude of this little boy’s statement. I had been working in and traveling India for the past 7 months, and Upper Dharamsala (McLeod Ganj), was to be my last stop before returning home to the West. As a Tibetan born in Canada, there was no higher calling, no person I’d rather meet than the Lama I have idolized my entire life. I had no idea he was even in town, but somehow I had been guided to being here, at this exact time. There was a buzz in the town. You could feel the sense of wonder, of excitement that we would be personal witnesses to such a transcendent man. Local Indians and Tibetan monks were loitering just to observe the scene. The line to meet His Holiness in His home the Tsuglagkhang complex, was winding through and spanning the entirety of the quaint hill station. It was approximately 1,500 people from 62 countries, including 300 Indians to be more precise. As we entered, each country was partitioned, kept in groups and in equal bewilderment. I was stationed with a group of about 40 Canadians representing every age and area, from Newfoundland all the way to Victoria. I had no idea what to expect, as the organizers cryptically withheld the details to the audience. This lack of information added to the experience, as I heard those around me eagerly hypothesizing what could transpire. Eventually, as the gates opened my heart rose into my throat and sank back down into my stomach. I felt a rush of every emotional extreme; pointless thoughts and past troubles cluttering my mind dissipated in an instant. Pure elation followed decisive numbness, while the fluttery crimson and orange robes began to materialize through the distance. Although 78 years young, it appeared in my mind as if He was gliding along the monastic floor. This was the Living Buddha, the physical manifestation of Chenrezig, God of compassion making His way towards me. His joyous, worry-free smile instantly captivated the crowd, and my imagination. A Caucasian woman next to me burst out into tears. Every hair on my body stood, as if magnetically attracted to the tangible aura of the Dalai Lama. There is much written about the achievements, philosophies and struggles of the Dalai Lama, but it is extremely difficult to put into words the aura and genuine happiness when in close contact with the physical being of the Dalai Lama. Forever smiling, laughing and cracking jokes, His inner light shines through and touches anyone lucky enough to be in close proximity. I felt that indescribable aura: a warm, kind energy that envelops the body and mind. In that moment, my head was clear, my emotions were pure and my thoughts genuine. I looked to my left, and the Chinese-Canadian woman next to me raised her eyebrows at me, as if to acknowledge what we were feeling together. As the Dalai Lama made his way to our group of Canadians, Tibetan khatas (white ceremonial scarves) were being tossed and thrown in the air. 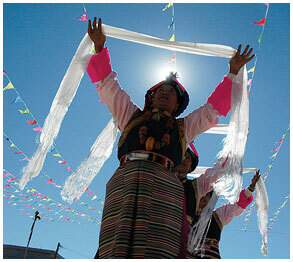 An elderly Tibetan-Canadian woman gingerly approached His Holiness, her back hunched over in respect and tribute. She presented Him with a khata, still gazing at the floor, hands cupped and folded together in prayer. As He accepted the gesture, His Holiness looked right into my eyes and smiled. In what felt like an eternity, I instantly felt like He knew everything there was to know about me. I was frozen. The words echoed from His lips, vibrating and resonating with our stirring hearts. In that moment, I realized the world was subject to my thoughts, not the other way around. I understood that we are not independent observers, that all of our experiences are truly shared. Every struggle and victory I’d ever been through had guided me to this serendipitous moment. Face to face with the Dalai Lama was my own reality, and now it’s yours. This article was originally published at Rignam’s blog. I don’t think you understand the meaning of the word “deconstruction.” Next time, if you don’t know what the meaning of the word is, please don’t use it. The way my mind was working at the time (in India), I feel deconstruction was the correct word. very well written and it makes me so happy to know that there are young Tibetans like you who still hold their Tibetan roots with so much pride when unfortunately a lot of our younger people are getting swayed in thinking that being modern and progressive means aping the westerners and forgetting your own roots. So true .. The way you described that moment, the feeling which we all go through. Well written!